Formed Tubular Heaters offered by us are available in Chrome Nickle Steel or Incoloy with nominal sheath diameter of 6.50mm and 8.00mm. 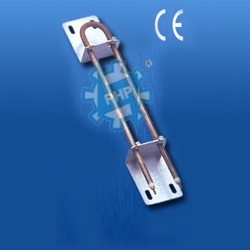 Standard elements have a terminal post which gives a cold section of approx 30mm for 6.50mm 35mm for 8.00mm.The helical wound heating wire is made of a high temperature resistant NiCr alloy. And the insulation consists of superior grade of magnesium oxide (MgO). As the heaters are swagged, even at high sheath temperature they have excellent electrical insulation and a high transfer. To prevent the heater from moisture the connection ends are sealed with sealing components. Formed Tubular Heaters is suppled in Chrome Nickel Steel with nominal sheath daimeter of 6.50mm and 8.00mm. Standard elements have a terminal post which gives a cold section of approx 30mm for 6.50mm and 35mm for 8.00mm. Swaged for Good Electrical Insulation & Even Heat. Transfer. 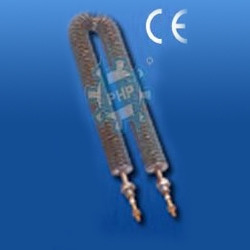 PHP tubular heaters are available in straight lengths or bent as per customer’s requirement with threaded stud connection at both ends. Finned tubular heaters have enlarged surface area to help faster dissipation of heat. 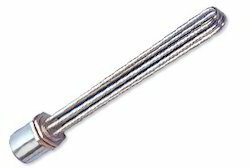 Plain tubular heaters are available in straight lengths or bent as per customer’s requirement with threaded stud connection at both ends. 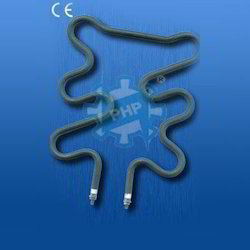 Finned tubular heaters have enlarged surface area to help faster dissipation of heat. Depending upon the material to be heated. For more information please download pdf catalogue. Tubular Immersion Heater finds use in different industry applications including for heating Oil, in Water Chemical Tanks & Oil Filtration Plants, in Electroplating Industry and others. Providing working as a support for heating liquids present in tanks and containers, these immersion heaters are suitable for meeting the demands of heating liquids like water, oil, heat transfer fluid and corrosive solutions. These heaters are suitable for use in tanks and pressurized vessels and can be provided with working voltage of up to 415 V, Surface Temperatures of 600OC Maximum and available diameters of 7, 8.2, 11 mm. Surface Loading Depending upon the material to be heated.